Sport motivates and connects people. Two of Brose’s projects designed to promote exercise have been recognized by the Federal Ministries of Food and Agriculture and Health with the “IN FORM” (IN SHAPE) logo. Walking 380 kilometers in 50 days. Ten soccer tournaments with 800 participants on three continents. These two projects are part of the Brose health management program and were awarded the “Wir sind IN FORM” (“We are IN SHAPE”) logo. This makes the family-owned company a recognized partner of the initiative of the Federal Ministries of Food and Agriculture as well as Health. 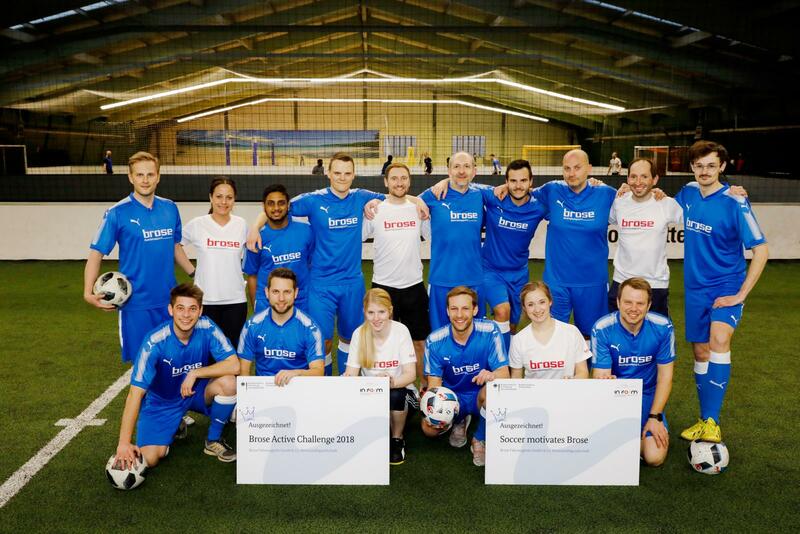 The automotive supplier received this award for its “Brose Active Challenge 2018” walking contest and its worldwide soccer tournaments under the banner “Soccer motivates Brose”. Both campaigns are aimed at encouraging employees to exercise regularly and promoting the idea of working as a team. The “Brose Active Challenge 2018” challenged the corporate group’s German employees to walk at least 10,000 steps a day for 50 days, a virtual distance of 380 kilometers. Over 1,400 employees at eleven German Brose locations took part in the exercise initiative. They walked a total of 940 million steps, which roughly equates to one trip to the moon and back. When asked for feedback, 71 percent of participants confirmed that they moved more during the contest than they had previously. “Soccer motivates Brose” takes advantage of the cross-cultural and international enthusiasm for soccer to promote solidarity and team spirit in the international company. Interested players first had to work their way through the national qualification rounds at over 40 locations on three continents. The most successful teams won a spot in the finals at the continental level. The respective victors were determined at the European Championship in Ostrava/Czech Republic, the Asia Cup in Shanghai/China and the America Championship in Puebla/Mexico. The company was able to motivate 800 employees from every level of its hierarchy to become more active together. Thanks to the initiative of former President and CEO Michael Stoschek, Brose has been actively involved in promoting employee health since the 1970s. The first records of company sports date all the way back to 1939. Today the family-owned company’s worldwide activities dovetail with its strategic health management program. Key objectives: preserving employee health, promoting health awareness and maintaining productivity. Ergonomically optimized workplaces that protect employee health and prevent injury are available along with family-friendly services, medical assistance, sport and fitness programs, balanced, high-quality catering services and training courses and lectures. IN FORM (IN SHAPE) is a German initiative designed to promote balanced nutrition along with an active lifestyle. It was launched as part of a national action plan in 2008 by the Federal Ministry of Food and Agriculture and the Federal Ministry of Health and has been active nationwide ever since, with project partners for every area of life. The “Wir sind IN FORM” (“We are IN SHAPE”) logo is awarded to projects with a strong focus in the areas of nutrition and exercise that support the initiative’s goals in a unique and outstanding way.